A few months ago, we featured a very sweet couple on our blog – Christina & Rich! Their March 4th wedding day was elegant and full of heartfelt moments. Click here to see the blog with pretty photos by Lisa Marshall Photography. The photos look like straight out of a fairy tale wedding, from Christina’s soft curls to Rich’s beaming smile. This is a wedding to remember after the groom serenaded his bride with the piano. There was not a dry eye at Up the Creek Farms! The second artistic piece of their wedding day display was a beautiful film by Andreo Studio. This film captures the reason why we love & adore wedding videography. In addition to capturing moments to replay for a lifetime, the film highlights precious words from the groom, from the officiant, and from family & friends. Being able to listen to such warm tributes is invaluable and sure to bring a smile across Christina & Rich’s faces each time they watch the film. The love between these two and also among their family is such a blessing, we feel lucky to have been witnesses to such a union! Our favorite parts of the video are at 1:56 when Christina is reciting her vows, and Rich makes us all have an LOL moment when he admits that they will undoubtedly laugh and cry together. 😉 Also, at 2:15 where you see Rich playing the piano for Christina and they capture each others’ eyes… just like out of a classic movie! Swoooon! Lastly, starting at 3:34 where the video comes to a close, we hear the officiant with his wish, prayer, and blessing – a touching overlay to the scenery and portrait shots of the wedding day. This particular wedding allowed us the privilege to meet the crew behind Andreo Studio. What we are loving about Andreo Studio is their warm versus modern edge in their portfolio of videos, which is thanks to their experience shooting films in Florida and in New York City. They have a storytelling theme throughout the videos, highlighting precious moments, heartfelt stories told, and wide angle shots of the event surroundings. To read more about Chad and the crew behind Andreo Studio, click here! A lovely arrangement of their films may be located by clicking here. Thank you for capturing such beauty here at Up the Creek Farms. 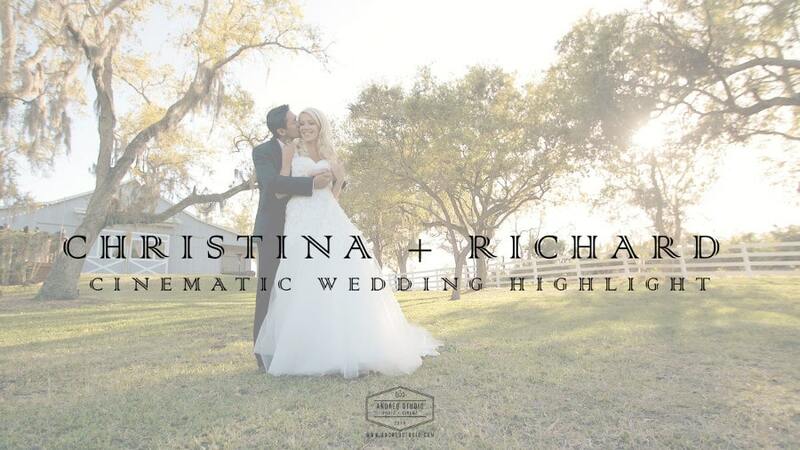 Click the photo below to view Christina & Rich’s Highlight Film! Thanks again to the following vendors who made unforgettable!